Turck U Grok It Smartphone RFID Reader U Grok It is the Smartphone RFID platform that enables organizations of all sizes the ability to leverage the power and benefits of RFID with an efficient and affordable reader and flexible development tools. Innovative solutions can be built to Identify, Locate, Track and Inventory tagged assets using the U Grok It Software Development Kits. The U Grok It fully functioning handheld reader/writer is lightweight, easy to use and works with iOS, Android and Windows smart devices. Based on standard RAIN (UHF Gen 2) RFID, with a 6-25' (2-7m) read range and the read speed and accuracy you require. U Grok It Grokker, Portable UHF RFID Reader, UHF Class 1 Gen 2, Audio Port Interface. Compatible with iOS and Android phones & tablets, and Windows 8 tablets. - U Grok It Grokker, Portable UHF RFID Reader, UHF Class 1 Gen 2, Audio Port Interface. Compatible with iOS and Android phones & tablets, and Windows 8 tablets. Select Product * Please select product Turck U Grok It Smartphone UHF RFID Reader for Australia/New Zealand works with iOS, Android and Windows smart devices. Turck U Grok It Smartphone UHF RFID Reader for Brazil works with iOS, Android and Windows smart devices. Turck U Grok It Smartphone UHF RFID Reader for China works with iOS, Android and Windows smart devices. Turck U Grok It Smartphone UHF RFID Reader for North America, works with iOS, Android and Windows smart devices. Turck U Grok It Smartphone UHF RFID Reader for Singapore works with iOS, Android and Windows smart devices. Turck U Grok It Smartphone UHF RFID Reader for UK/EU & India/Turkey, works with iOS, Android and Windows smart devices. 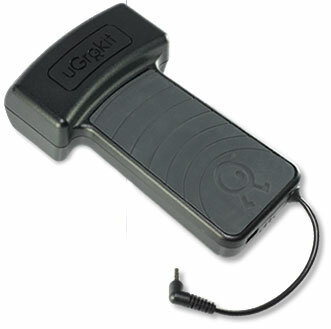 U Grok It Grokker, Portable UHF RFID Reader, UHF Class 1 Gen 2, Audio Port Interface. Compatible with iOS and Android phones & tablets, and Windows 8 tablets.